The following article introduces 3 order types that are available for you on Bybit. They are Conditional Orders, Market Orders and Limit Orders. This order type is executed instantly and filled at the best available price from the order book. The two order types available are buy market orders and sell market orders. However, though the execution is guaranteed, the price at which it will be executed is not, as it may quickly change. For market orders, charges for taker fees will apply. This order type pre-sets a price at which to fill in the order. This guarantees the price but may take longer to be executed. 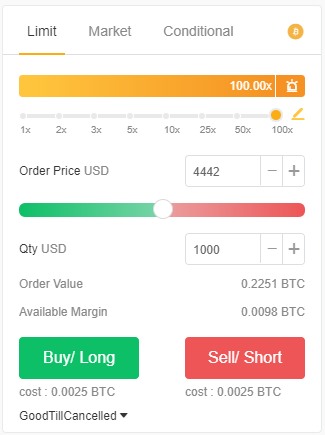 For Buy Limit Orders, the order price must be set at a price lower than the last traded price, or it would be filled immediately as a market order. The same applies to Sell Limit Orders, but the order price must be higher than the last traded price. Once a limit order is submitted, it will be placed in the Order Book and pending execution. 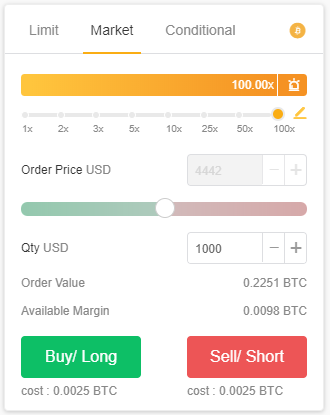 Traders can check all their active orders in the “Position” Tab. A limit order’s filled quantity may differ depending on the Time in Force option used. It is a special instruction used to indicate how long an order will remain active before it is executed or expires. On Bybit, there are three types of Time in Force options for Limit Orders. GoodTillCancelled (GTC) orders remain effective indefinitely until fully executed unless canceled by the trader. ImmediateOrCancel (IOC) orders must be filled immediately at the limit price or better. If the order cannot be filled immediately or fully, the unfilled portion will be canceled. FillOrKill (FOK) orders must be immediately and entirety filled at the limit price or better. Otherwise, it will be canceled. No partial fills are allowed. How to use Limit orders? First, Limit Orders can be used as Market Orders with a limit to the final execution price. A trader would like to buy 10,000 contracts immediately with a maximum execution price of no more than 8,001 USD. If he uses GTC, 5,000 contracts would be filled immediately, while the remaining 5,000 contracts would be placed in the order book, and pending execution. If the trader uses FOK, as there are less than 10,000 contracts available in the order book at the moment, nothing would be filled, and the order would be canceled. But if he uses IOC, 5,000 contracts would be filled at 8,001 USD and the remaining orders would be canceled. Limit Orders can also be used as a Take Profit Limit Order to partially, or fully, close a position. They are advanced orders that submit automatically once specified criteria are met, namely a trigger price. Once the preset trigger price meets the Last traded price, a conditional market order will be filled immediately, while a conditional limit order will be submitted to the order book and pending for execution. This limit order will, then, only be filled once the last traded price reaches the preset order price. Let’s look at an example to see how conditional orders can be used to mimic common order types. By using Stop-Entry Orders, traders are able to trade a breakout on the market. 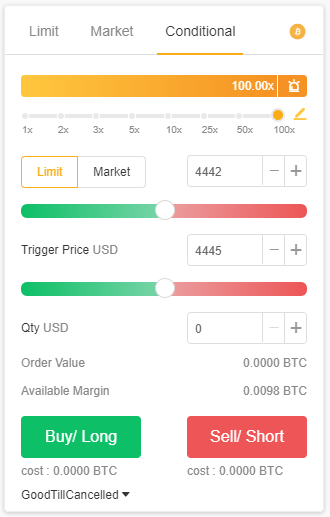 On Bybit, traders can use a Conditional Market or Conditional Limit Order to set up a Stop Entry Order. For buy Stop Orders, the trigger price must be higher than the last traded price, while for sell stop orders, the trigger price must be lower than the last traded price. A Stop Loss order is an instruction to close your position to limit the loss. It is exactly the same as a Stop-Entry Order but is used as an exit option by traders. By using a conditional order, we can customize the stop loss order as a stop loss market order or stop limit order and have the flexibility to partially close a position. A Take Profit Order is an order that closes a position once it reaches a certain level of profit. As mentioned earlier, it can be achieved through Limit Orders. But how to take profit by partially closing an existing position with a market order? To do this, use a Conditional Market Order with a trigger price set to be better than the current last traded price along with the desired quantity of contracts. Take Profit Orders are commonly used as an exit option, but can also be customized as an advanced entry order on Bybit’s platform. 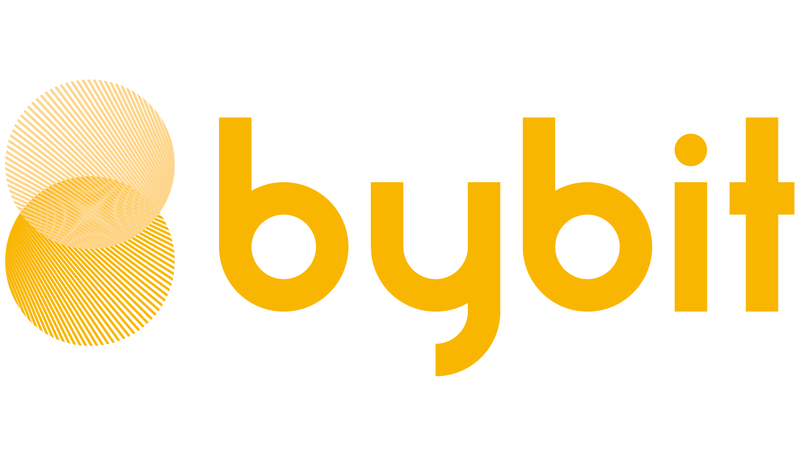 This closes today’s article about Bybit’s order types. Should you wish to learn more about Take Profit or Stop Loss please watch the corresponding video, read the associated article, or head to the reference pages on Bybit’s website. Follow us for more information on the exciting world of cryptocurrencies.